U.S. VIRGIN ISLANDS (January 28, 2016) - The U.S. Virgin Islands will welcome some of the world's leading marathoners for a special cruise marathon next week. The USVI Department of Tourism and the St. Thomas Association of Roadrunners (STAR) are partnering with international adventure-travel company Z Adventures to host the St. Thomas Cruise Marathon, set to take place on the island on Monday, February 1, 2016. The marathon is part of the cruise adventure dubbed "Southern Caribbean Challenge," where renowned amateur athletes will be participating in six marathons in six destinations over the course of a one-week cruise vacation. The event will start in San Juan, Puerto Rico, on January 31, followed by runs in St. Thomas, Barbados, St. Lucia, St. Kitts and St. Maarten, where the final event will take place on Saturday, February 6. "Supporting this event is in keeping with our goal to further develop sports tourism opportunities in our islands," said Joyce Dore-Griffin, Assistant Commissioner of Tourism for the U.S. Virgin Islands. The idea for the cruise adventure was developed by Ziyad Rahim, Founder and CEO of Z Adventures, who is well known in the extreme marathon world. Rahim, an adventure runner from Pakistan, holds multiple Guinness World Records in long-distance running. In 2015, he took 36 runners from around the world to attempt seven marathons on seven continents in the least number of days. The team completed the feat in 10 days and broke 13 Guinness World Records in the process. The 34-member group coming to St. Thomas comprises runners who, combined, have broken more than 20 Guinness World Records, and have participated in more than 2,500 marathons in more than 100 countries. The youngest competitor on the trip is eight years-old and the oldest is 78. "The whole idea of arranging this adventure is to allow runners to complete a marathon in as many destinations as they can, and at the cheapest possible price," said Rahim. "There are runners who have completed marathons in 80 to 100 countries but none has competed in the U.S. Virgin Islands," he added, explaining that most of the runners are part of Marathon Country Club and Marathon Globetrotters, whose aim is check off as many countries as they can. "These are everyday folks with families and full-time jobs who are keen to attempt challenges that are out of their comfort zones". The group includes notable athletes from different nations, such as Juergen Kuhlmey from Germany, who at 78 has run more than 500 marathons in 57 countries; Tuedon Morgan of Nigeria, a 42-year old mother of four who began running marathons to change her unhealthy lifestyle and now holds two Guinness World Records; and JC Santa Teresa of the Philippines, who is a Guinness World Record holder for completing 21 ultramarathons in consecutive days. 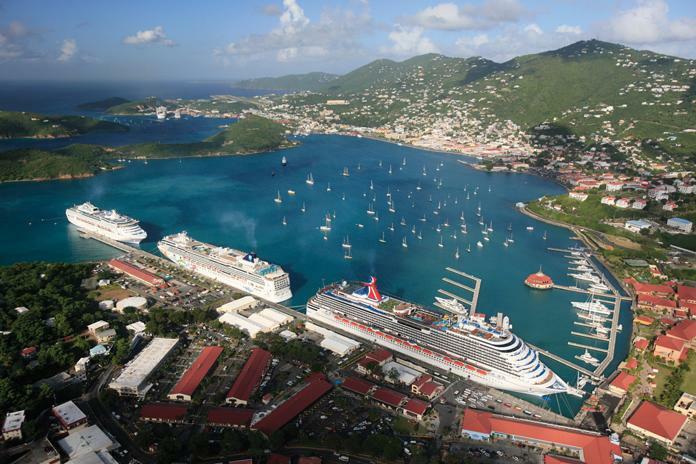 The Department of Tourism and STAR are working with Rahim to make the Cruise Marathon an annual event for St. Thomas. For further information and to participate in the race, contact Angela Payne at + 1 340 774 8784 or adpayne@usvitourism.vi.